Or as my kids would say – Epic fail!! Making the dots was easy, but actually using them for toothpaste was the hard part. Some experiments in lightening your camping setup result in failures and that’s ok. They either become too lightweight and don’t hold up, or they are too uncomfortable. For this attempt, the toothpaste dots were uncomfortable enough that the weight savings were not worth it. 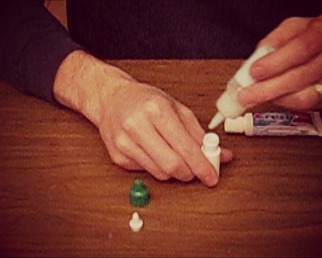 At this point, you may be thinking, “who in the world tries to make toothpaste dots”? Good question. The first place I saw them was in Mike Clelland’s book ‘Ultralight Backpacking Tips‘ which is a great book with a lot of lightweight tips. The topic has also been discussed on ultralight forums and there was a post at It’s Tactical earlier this year. Yeah, I’m a little bit crazy but there are others that are crazy enough to try and actually enjoy toothpaste dots. So I think that makes me almost normal if you think about it. Anyhoo, back to the dots. Instead of carrying a ginormous travel tube (sarcasm) of toothpaste when camping, why not come up with something smaller and lighter. You could transfer toothpaste into a smaller container, or you could lighten up even more with no container at all. That’s the real motivation for the dots – less weight by removing the container. Making them involves nothing more than squeezing out dots of toothpaste onto wax paper and waiting for them to dry out. Once the dots dry for about a week and become “not too sticky”, you can package them into a small bag. Then it’s time to hit the trail. At teeth brushing times, pop a dot into your mouth, and chew it up until it returns to it’s original toothpaste consistency. Then you brush your teeth. For me, chewing up the dots and trying to get them back into a paste was not a pleasant experience. It’s one of those texture things we have with food. Some people don’t like tofu or cottage cheese because of the texture. I don’t like toothpaste dots because of the texture. My camping dental care will continue to contain real toothpaste in a tube or a small container. I’m more than happy to take on a slight increase in weight for comfort in this case. We’re talking about a half ounce or less in weight here. The real lesson here is not about toothpaste or even small weight savings. It’s about continually refining your setup to find that optimal balance of comfort and weight. Over time, our preferences change, gear materials change, and even our goals change. What worked on the last trip or last year may not work this year. It’s ok to try something new. It’s even ok if that something new doesn’t work out. That’s certainly the case with toothpaste dots, and you dot lovers can keep them to yourselves. Yuck. 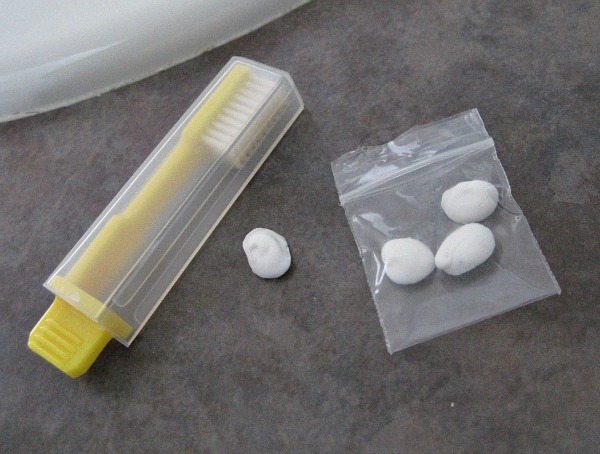 Did you ever consider just squeezing some toothpaste into the little baggie? I think it would be just as light, compact, and easy, but without the texture issues. It’s worth a shot. Light travel, thanks for stopping by. That would be a good solution, but for now I’m just using a small squeeze bottle or just a sample size tube of toothpaste. Not the absolute lightest, but it works for now. Friends have squeezed a strip into aluminum foil & essentially made a small tthpste tube,w/ 1 end folded & the other able to squeeze out. An idea. Jess, I’ve never thought of doing it that way, but it would work and be much smaller than a travel size tube of toothpaste.